To maximize your association membership (Local and ATD membership together), click the logo below and go directly to the ATD Store to process your membership. Don't forget to add the Greater Cleveland Chapter to your membership (use the Add-On feature). To join our Local Chapter ONLY, select your membership level below. Current ATD members and contacts must log in to renew or begin a membership. If you have never logged in to this website, your email address on file will serve as your login and your password is password. Once logged in, you can renew your membership and update your password by updating your member profile. Please do not begin a new membership application if you are already a member. Questions? 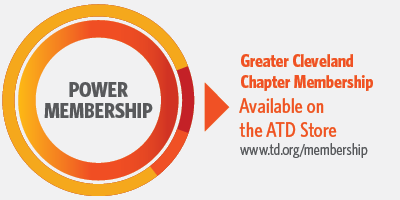 Contact the chapter office at (440) 668-2219 or membership@atdgreatercleveland.org. Corporate Membership - $60.00 (USD) Subscription period: 1 year No automatically recurring payments This membership is for employees of the same corporation. This membership requires a minimum of three members. Member In Transition - $25.00 (USD) Subscription period: 1 year No automatically recurring payments This membership rate is for persons who are currently not employed. This membership is valid for a maximum of 12 months. Student Member - $25.00 (USD) Subscription period: 1 year No automatically recurring payments This rate is for current students who are not employed full-time. This rate is valid for one year and can be renewed if student conditions still apply.